There are a number of great stick welders on the market. Many of them double as either TIG or MIG welders too, but we’ll try to look especially at their stick capabilities here. By Gregory Sanders: This article has been updated to reflect the most accurate information regarding stick welders available for those who are interested in stick welding. The best 5 available have changed, and information has been added to assist individuals in finding the best stick welders currently available on the market. The FAQ has also been updated. The AHP Alpha TIG 200X is a portable welding machine that is great for small spaces. From its name, you know it’s TIG compatible. It offers a great deal of precision and lays down a smooth bead. This machine offers both AC and DC modes without an output range for 5 to 230 amps. It also allows dual voltage for running it on a standard household line or a heavier duty line. This welder uses Pulse Width Modulation along with IGBT to give you high amps in a small box. Combining these two methods also gives more precise control of your arc. At 150 amps, the machine has a great 60% duty cycle. Just a note - our information is based on the 2017 model, although the 2018 is now available and should offer some improvements. AMICO offers this low-priced welder that features both 115 and 230 volt input. Unlike the other machines on the list, this is a dedicated stick welding machine. That also helps keep the price lower than other models. It’s a DC-only machine. It can output 160 amps with a 60% duty cycle. It can handle workpieces up to ¼” thick. This Lotos TIG welder also gets good ratings for stick welding. It provides DC output in both modes. The machine can run on either 120 or 220 volts. Maximum output goes from 100 amps up to 140. The duty cycle is 35% for both levels. The welder is ideal for welding tasks where portability and performance are required. This is a transformer-based machine, unlike the first three which have inverters. That means it’s not quite as portable. Weighing in at just over 100 pounds, this machine offers some great features. The Stickmate runs on 230 volts in. It offers dual output. In DC it can go up to 160amps, while in AC it reaches 235. The duty cycle is around 20% for 225 amps AC, or 150 amps DC. It can handle up to ½” mild steel. 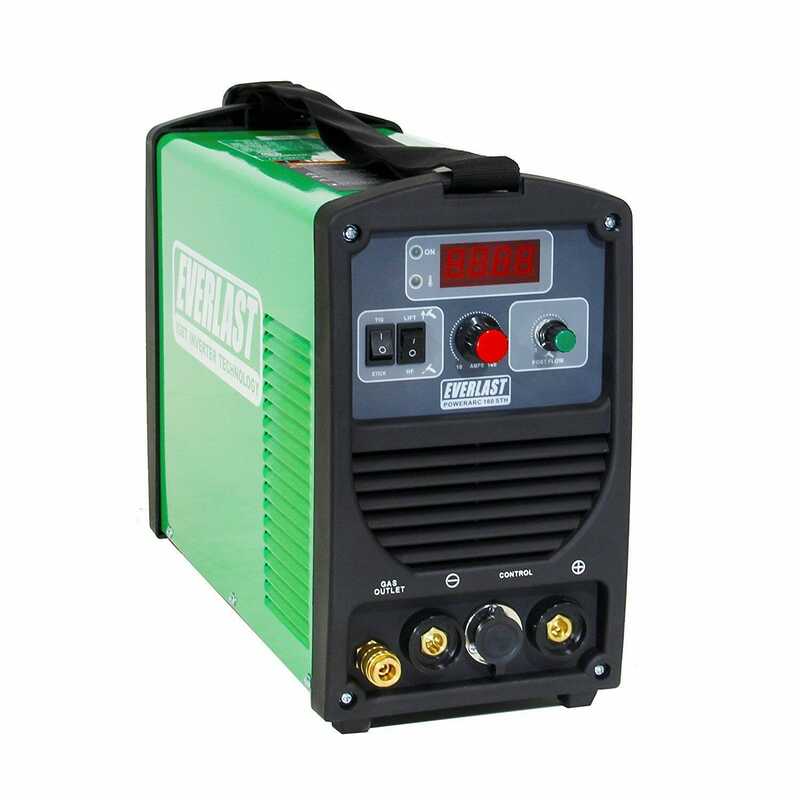 Everlast is another known commodity in the welder manufacturing business, and their PowerArc 160STH doesn’t disappoint. This is another inverter model and has dual input. It can run in both TIG and stick modes, with DC output for each. The machine outputs up to 140 amps for stick or TIG. When on 120 volt input, it has a duty cycle of 60% at 65 amps. On 240 input, that same duty cycle will allow you to weld at 110 amps. Stick welding offers versatility and simplicity of operation. That’s not to say it’s easy; but it can require less equipment than other methods. That has helped make it perhaps the world’s most widely used welding technique. This process is used extensively in the construction of heavy steel structures and for industrial fabrication. This process is mainly used to weld together iron and steel. It can also be used for stainless steel. With care, you could use it to weld aluminum, nickel and copper alloys together. It is also good for welding different thicknesses of material. Stick Welding is more formally known as Shielded Metal Arc Welding (SMAW). This is a high temperature welding process. The electricity that passes from the welder, creates a temperature that can be as high as 7000 Fahrenheit. Of course, getting the right temperature is essential, because many metals will melt at far lower temperatures. Stick welding accounts for more than half of all welding activities in many countries. Owing to it’s versatility and ease of use, it is particularly popular in the repair and maintenance industry. Compared to other welding types, the equipment used in stick welding is rather inexpensive and portable. In the case of stick welding, the auxiliary gas shielding or granular flux are not required. Stick welding is also suitable for most metals and alloys. A huge advantage of stick welding over methods like TIG and MIG is that it can be carried out anywhere. Environment and location are far less important for this technique. Obviously you would want to try it in extreme weather, but it can be done in windy or rainy weather. Gas and water hoses are usually not required. Also, it can be used on less-than-immaculate work-pieces. On other other hand, stick welding machines generally have low duty cycles. That means it can take longer to do a project as you wait for your machine to cool down. Also, stick welding is not easily mechanized. That actually may be great news for welders - it keeps jobs open. Finally, it’s not safe or suitable for reactive metals such as titanium and zirconium. Since it doesn’t have gas shielding the weld can more easily become contaminated. Also, the stick welding arc may be too hot for metals with lower melting points. Like all welding processes, stick welding offers its unique benefits and challenges. While MIG is still the easiest process to learn, stick offers its own kind of simplicity. It can also be less expensive in terms of the welder itself, and lower outlays for consumables. A wide range of mach ines offer dedicated stick welding or a combination, usually along with TIG. Figure out what best suits your needs and see how well you can get the job done!